Pause is a weekly personal development group for young women aged 14-19 run by Women’s Community Matters in Barrow. It aims to build confidence and self-worth in a safe environment through activities, discussions and one-to-one support. The group wanted to identify what attracts women to the centre and how it and other agencies can improve services to young people. #TheFutureIsMe project received £5,000 from the #iwill Fund to look at how young people can best be supported, as rather than complain, the group wanted to put together a toolkit that agencies can use to better support young people. The project employed Emily, a young person who had previously accessed the services, and worked alongside the project manager. 12 young women were involved in the project, many having complex issues or involved with a variety of agencies such as social services, CAMHS and youth offending. Through a series of consultation events, the young women were asked to shape the future of the centres services and explore the way professionals work with young people. 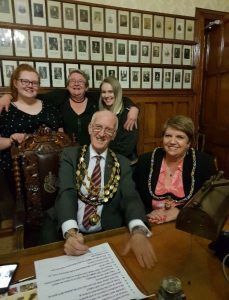 They decided they wanted to share their stories of the difficulties young people face at an event aimed at local service providers and encourage them to sign up to the Young People’s Charter – a 12 point list of how young people want to be treated. The event was attended by council leaders, service provision managers, social workers and other education professionals. Police and Crime Commissioner, Peter McCall also attend the event and was so impressed with the group, he invited them to join the Cumbria Youth Commission and jointly address issues that are important to them. Barrow Borough Council have since debated and discussed the charter and voted to enshrine the charter into council policy in October. All the learning from this project will be used to inform future social action projects for the young women and also with the young boys/men group which is starting in December this year.